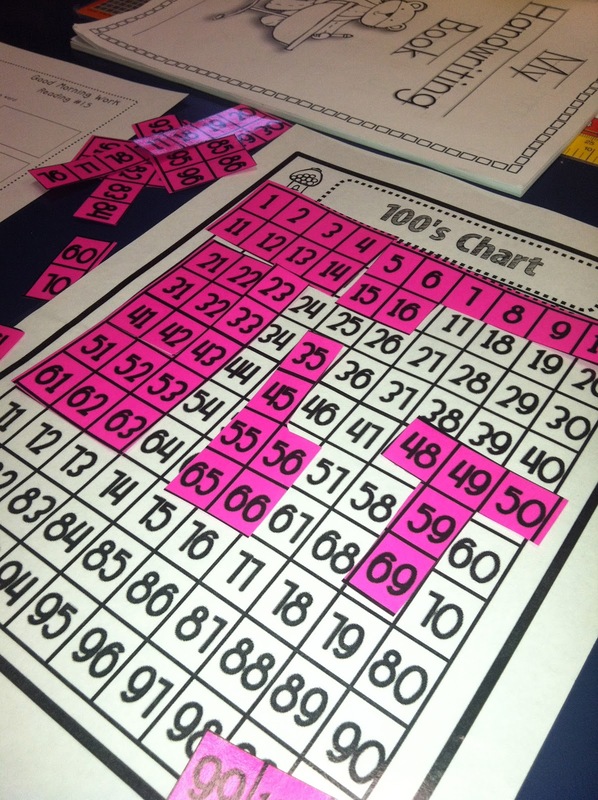 The last two weeks we have been working on the skills of using and manipulating our 100’s chart. We are working on adding and subtracting 10 from any number and recognizing when numbers are missing without having to count. CC Standard: 1.NBT.5 given a two-digit number, mentally find 10 more or 10 less than the number, without having to count and explain the reasoning used. We have been playing a bunch of games to help us with these concepts. 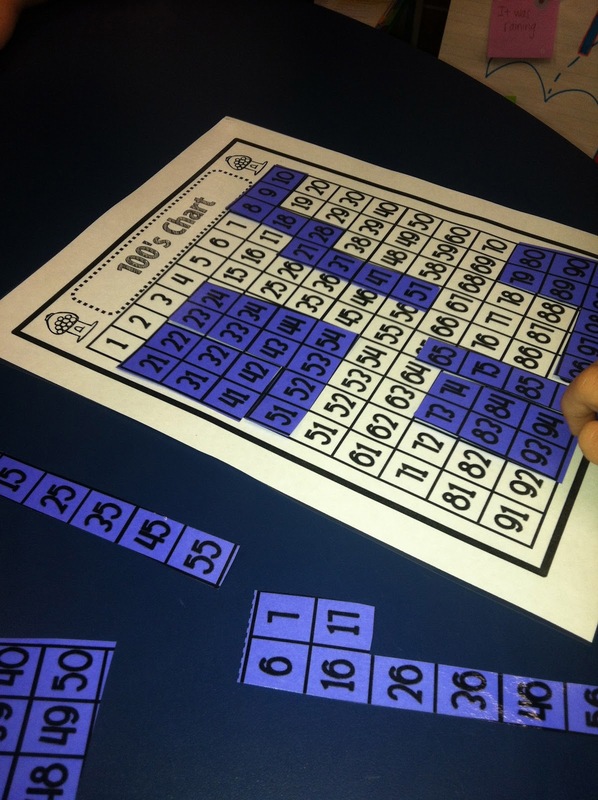 Our favorites include number puzzles, cover a number and life sized puzzles!! For their mini puzzles I printed out hundreds charts on white and BRIGHT colored paper and laminated both copies. (I have one set for every student) Then I cut the NEON paper into different shaped puzzle pieces. 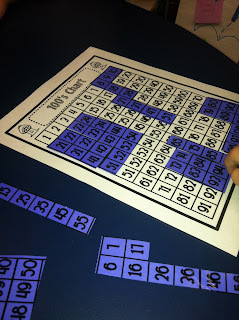 Students work to cover their entire 100’s puzzles quickly and quietly. It’s amazing how fast some of them can do this compared to how long it takes others!! The next game that we really like is a game I call “cover a number.” In this game, students partner up. All groups need 6 unifix cubes and one hundreds chart. Then one student closes their eyes while the other student covers 6 numbers. Then the student whose eyes were closed must correctly tell their friend what numbers they covered. My kids really enjoy this game!! Then students must work together to put the puzzle together! The first time we tried to put it together it took a good 10 minutes. Then we sat in a circle and talked about what worked and what didn’t work. We also talked about how we can use our resources (our 100’s charts!) and our friends to help us put the puzzle together quickly. The class then brainstormed how they could help each other and we tried to complete the puzzle in less then 2 minutes. Bless their hearts, they did it and they were over-the-moon excited for each other. Next week we will venture off the deep end with numbers 1-100. After that I will have two teams competing against the clock to see how fast each team can put their puzzles together! I’ll let you know how it goes!! And so it goes, tomorrow is Halloween… I hope you all have a non-crazy, super focused class day… hahaha….. right. GOOD LUCK!!! All of these games and more are now available in this packet!! Wow! 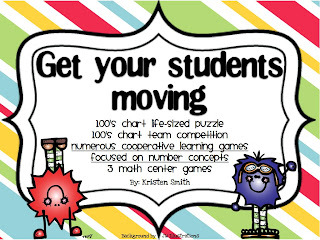 These are awesome ideas for reinforcing hundreds chart skills! A few of my second graders are still really struggling with us! Thanks so much for posting this!! I’m off to snag my copy of your pack! 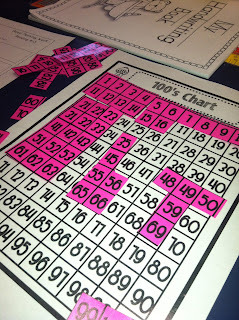 It’s August….now, but I just discovered your hundred chart activities, and find them very fun! I will be using them now, with CCSS 120 charts! Thanks! These are wonderful. We will be working on hundreds charts this fall. thanks so much for the clear directions.. I really like the cut up hundred chart. I will use this year. Thanks for the idea. Do you have the large # available for download?